Rain jackets are a must-have for those rainy or misty days. It’s made with waterproof fabrics that can help keep you dry whether drizzle or downpour. 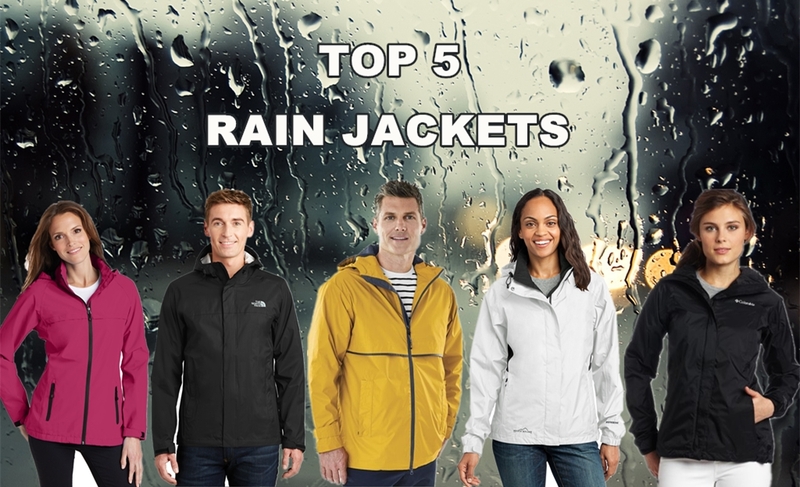 At NYFifth, we offer a wide variety of rain jackets from popular brands like Columbia, The North Face, Charles River Apparel and much more. Our raincoats are great for work, hiking or outdoor adventure while it is raining. Plus you can add company logo, monogram, or what you like to the rain jackets with our screen printing and custom embroidery services! These custom jackets would be perfect holiday gifts or corporate gifts for your family, friends, and clients. 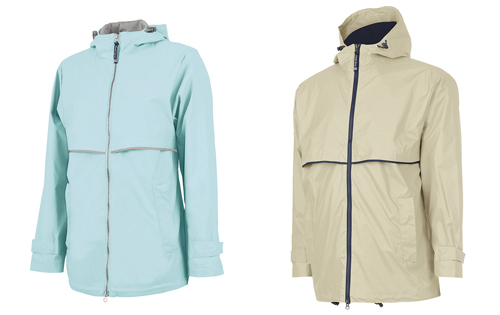 Block out the elements with our Charles River New Englander Rain Jacket for men (right) and women (left). This classic rain jacket is lined with mesh for air-flow circulation and is made from polyurethane that is bonded to a woven backing, providing additional fabric strength. The Charles River New Englander jackets comes in a pullover style and is also available for kids and toddlers! These rain jackets can be customized with embroidery and screen printing for the holidays. 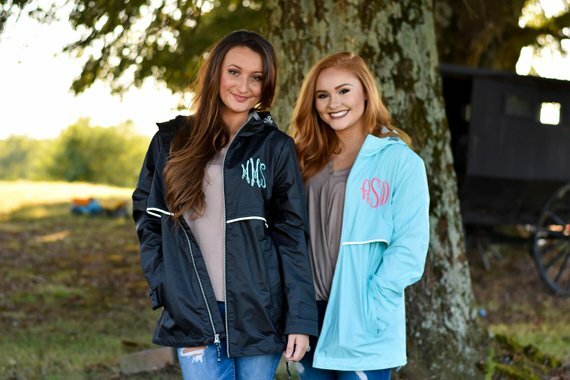 Holiday Gift Idea: A Charles River New Englander Rain Jacket monogrammed — would make a cute holiday gift to give your loved ones! Drizzle or downpour, Columbia Sportswear has an extensive selection of rainwear. 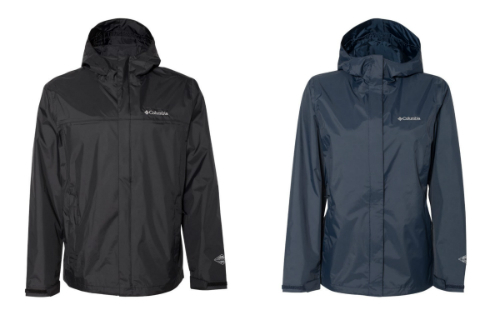 The rain jackets that we’ve been loving this year are the Columbia Women’s Arcadia II Rain Jacket (right) and Columbia Men’s Watertight II Rain Jacket (left).These Columbia rain jackets with hood are the best lightweight rain jackets for hiking, traveling, or just for everyday wear! Constructed with nylon 2L full dull plain weave and polyester fine mesh lining, these Columbia performance rain jackets are going to keep you dry and comfortable in any type of rainy situation. Plus, these jackets are also packable rain jackets that fold into a hand pocket, making it easy to travel and pack along when on-the-go! 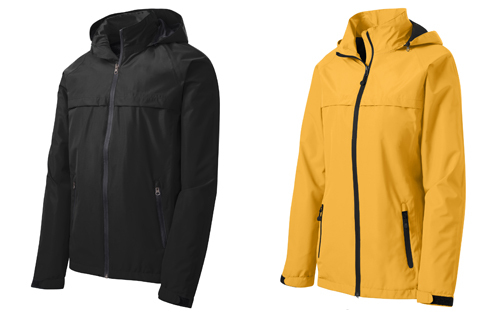 The Port Authority Torrent Waterproof Jacket for men (left) and women (right) is a versatile, fully seam-sealed jacket. It offers outstanding waterproof protection to keep you dry whether you’re on the job or on the trail. It’s convenient to fold it into a drawstring carry pouch for compact storage and easy carrying. From misty mornings to evening downpours, the Eddie Bauer rain jacket for men (left) and women (right) will help keep you dry, warm and protected from whatever Mother Nature throws at you. This fully seam-sealed, completely waterproof colorblock jacket is constructed with polyester dobby shell, mesh body lining, and nylon accents for durability and breathability. 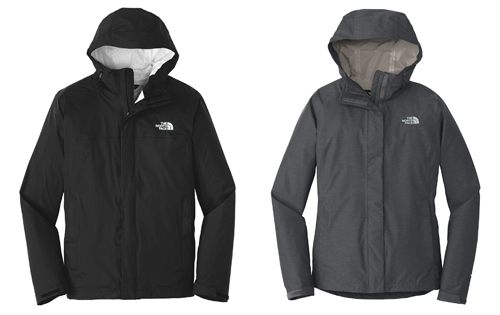 The North Face DryVent Rain Jacket for men (left) and women (right) is made with an environmentally friendly membrane that will let you explore the trails without getting soaked. 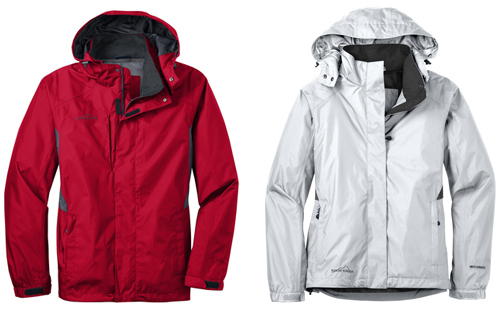 This waterproof, breathable, technical jacket is perfect for hiking, or outdoor adventures. You can add your company logo to The North Face rain jackets with our imprinting services that would be perfect corporate gifts for your clients thus taking your business to the next level! Need customization? NYFifth also specializes in custom embroidery and screen printing. We offer imprinting services on all out products at low competitive costs. Whether it is for big fundraisers or for small businesses, we’ve got you covered. For imprint inquiries, call us today at (877) 695-9722 to email us at support@nyfifth-inc.com today! Next PostNYFifth’s Black Friday 2018 Deals!